Hi there! How did the week go for you? Hot here, and I'm not complaining, YET, because today is a cool down. I thought we had some rain coming too but looks like they took that off the schedule. I haven't done much sewing lately. I know my problem is fear of commitment. Every time I look online I see something I want to make but then before I can do anything there's something else. So for now I just made a little star. I was looking through my block book and found this pretty Star of Hope so yesterday I made it. Not perfect by any means, but I enjoyed making it. It's a 4 in finish, and features my biggest challenge, making those inner triangles meet nicely. I made it from scraps on my cutting table.. tiny pieces used up. Just in case you missed it on Instagram, I did finish my cute scissors fob from Monday! Super fun. I'm not used to doing that type of sewing and it was fun, Roseann encouraged me to get busy and probably thought that was the last she'd see of it. Thankfully her book A Little Something, had everything I needed to know to complete it. So cute. I've got it tied onto my red scissors as you maybe saw on Instagram. 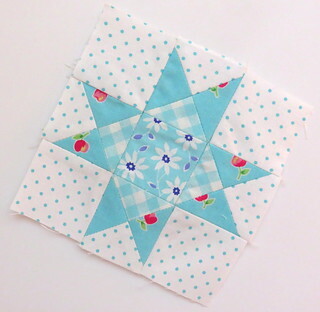 Love your little star block, one of my favourites. 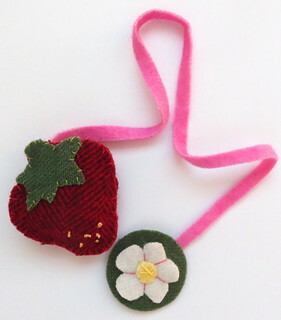 Your little strawberry project is adorable! Happy weekend Pam.